The sp-800p are the most cost-effective solution vision sound. They are designed specifically for small meeting rooms and classrooms. 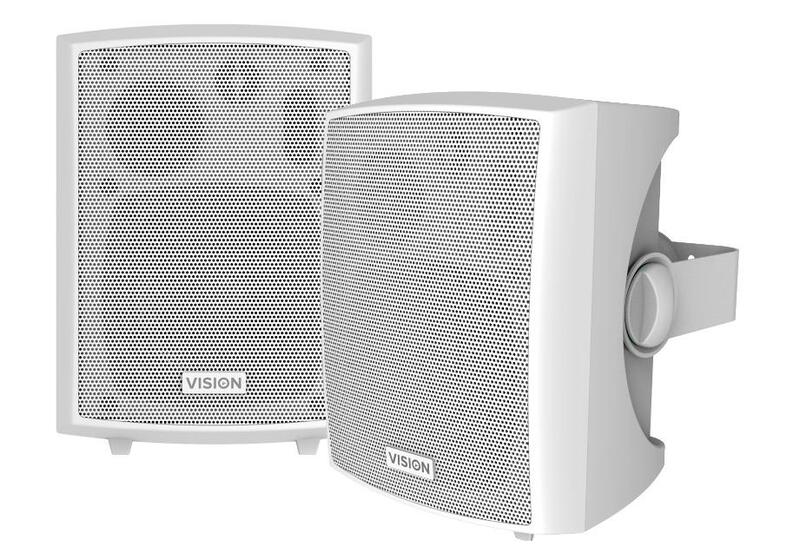 They offer an incredible value, superb sound quality and ease of installation feature vision brand. They have a woofer (bass) 4 "supplemented with (treble) tweeter and squawker (media). By dividing the frequency spectrum into three drivers, distortion is reduced. The volume control is on the back of the speaker "master" (which contains the amplifier). It is turned off by turning counterclockwise to clockwise. Adjustable clamps allow the installer to easily tilt the angle 30 ° up or 30 ° down. Also they are used as desktop speakers removing the clamps. The rear panel of the master speaker has rca inputs and dual mini audio. For the shell it was used a high strength plastic material, which gives it an attractive curved design, and a rigid acoustic chamber that emits a sound without distortion. . The reflector bass port allows greater excursion woofers, allowing it to produce lower frequencies, and the movement of air circulating phase delay from behind the woofer to the front further boosting bass. The amplifier gives priority to input minijack; therefore, if something is plugged into the mini-jack input, the audio will not work. Use an adder-cable to meet two entries in the mini-jack input. Note: from mid-july 2016, it will change to inputs combined. 1 x Power supply, 2 x wall mounts, speaker cable 1 x 5 m.